Prepare your wrought iron fence for winter with these tips. A wrought iron fence provides a special elegance to your property. It only follows that it requires special care for the winter. Knowing how to prepare your wrought iron fence for winter will help you to extend the life of your fence and protect your investment. Here are a few things you can do now to ensure that your wrought iron fence still looks brand new come spring. Cleaning your wrought iron fence once a week is a good way to improve its longevity, but cleaning it even once a month will have a big impact. Cleaning your fence before the first snowfall is a good way to ensure you won’t have a big cleaning job ahead of you in the fall. This is because snow tends to accumulate dirt and grime, leaving it on your fence when it melts. You’ll only have one season’s worth of grime to clean off in the spring if you clean your fence now. Should you remove rust before winter sets in or just wait until after the snow has melted to tackle rust? The best way to tackle rust is to clean it off before the first snowfall. Winter is hard on metal fences, and the melting snow will only make existing rust worse. You can use a paint scraper and a wire brush to scrape away surface rust. If the rust is extensive, you may want to consider replacing part or all of your wrought iron fence. After removing rust, it’s a smart next step to sand, prime, and paint your wrought iron fence. Sand off any loose paint chips and wipe down the fence with a rag. Then, apply a primer, allow the primer to dry, and apply a rust-resistant metal paint. You’ll need to make sure that you do all of this on a day when the weather is nice, as nothing should touch the new coat of paint for two hours as it is allowed to dry. Your fence will look brand new! 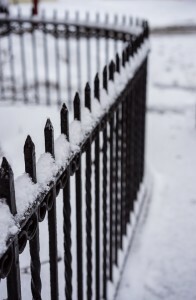 This is one of the best ways to prepare your wrought iron fence for winter. This entry was posted on Friday, November 18th, 2016 at 7:04 pm. Both comments and pings are currently closed.